You probably already know some of the foods people eat that can be dangerous for dogs, such as chocolate, but you might not know that a number of seemingly healthy fruits and vegetables should be avoided as well. Here is a list of eight different types of produce that can be toxic food for dogs. Grapes and raisins can cause kidney failure and irreversible kidney damage within 24 hours of being eaten. Parts of tomato plants, like the vines, stems, and leaves, contain a harmful alkaloid called atropine (tomatine poisoning), which can cause serious problems if eaten. Green or unripened fruit has less of the toxin but can still cause stomach upset. Although ripened red tomatoes are not as likely to make your dog sick, they should not be a part of a regular dog food diet. There are mixed thoughts about feeding dogs garlic. When fed in small amounts, garlic is said to be beneficial for your dog because it’s considered one of nature’s antibiotics. On the other hand, when ingested in larger amounts, both garlic and onions (in fresh, dried, or powered form) can cause anemia and stomach upset due to the destruction of red blood cells. All parts of the plant and seed-pit should not be eaten by dogs. If they do, dogs could experience painful oxygen deprivation leading to possible death and pancreatitis. It is still being debated by the scientific community if the actual avocado meat and oils are poisonous, so it may be best to avoid feeding any part of the avocado to dogs. This includes apple seeds and pits from cherries, plums, peaches, and nectarines. Apart from the obvious chocking hazard, fruits pits and seeds should not be ingested by dogs because they can cause bowel and intestinal obstruction. They also contain the poison cyanide. Death or cardiac arrest are possible after ingestion within two to four days without treatment. Symptoms of cyanide poisoning: dilated pupils, hyperventilation (rapid breathing or panting), shock, vomiting, cardiac arrhythmia, and skin irritations. Persimmon and its seeds in particular can cause diarrhea, then intestinal inflammation. If you suspect that your dog may have ingested any of these toxic foods, contact your veterinarian immediately. Also, keep in mind this list is only some of the fruits and veggies that are toxic to dogs; there are also poisonous foods from the other food groups. 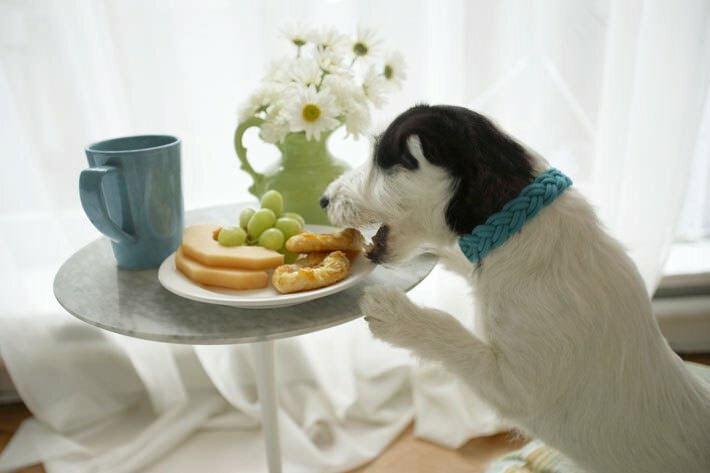 For your dog’s health and well-being, get on the internet and do your research before feeding him or her those seemingly harmless table scraps!